As things tend to when I’m not paying attention (which is almost always, apparently) a significant date has crept up on me. In particular, Fyon, my five-year-old niece, has her sixth birthday in a week. An auntie-stitched project of some sort is practically de rigeur, of course, but in the past the sheer physical distance meant that delivery dates were, well, flexible. Sometimes six months late flexible. Not so much when we’re spitting distance away. 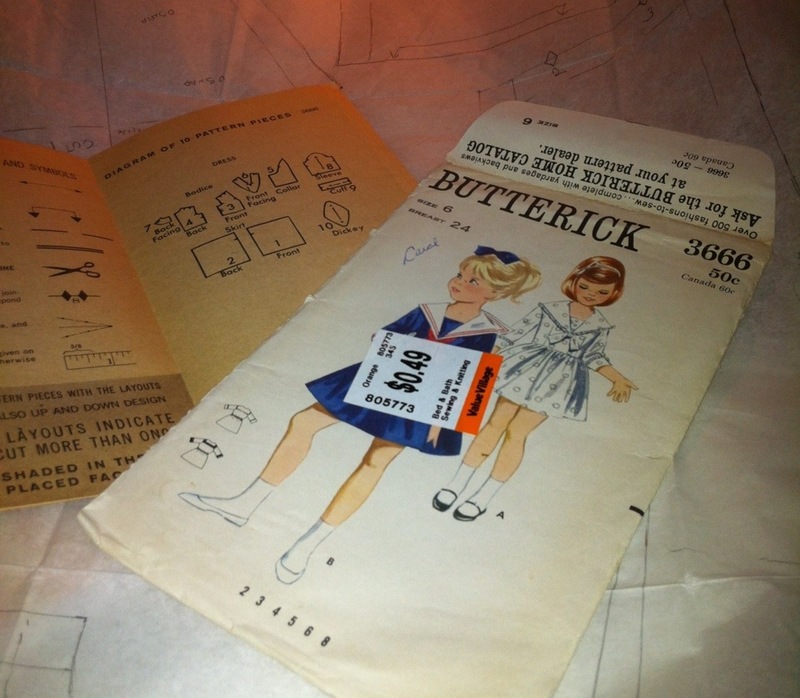 Happily, it didn’t take much for me to pick a pattern: Butterick 3666*, a darling little sailor dress in the right size that I already know Fyon adores (because a favourite game these days is paging through the pattern listings on Auntie’s phone). Best of all, since we’re currently in the depths of the Canadian winter here, it has SLEEVES. A little more thinking, and a wee bit of fabric enabling, and I had acquired an eyelet cotton for an overlayer and a solid navy underlayer, which will look smashing, I think. Unless I decide to go white-on-white. But, as I traced off the (uncut!) pattern, some troubling features became apparent. The dress has, um, some very vintage details. Like a side placket that closes with hook and eyes, and a little dickie in the front that snaps open and closed. It brings to mind fond childhood memories of the sailor dresses in my Grandma’s tickle trunk, which originally belonged to my mother and her sister. It also reminds me of how damn annoying those little snaps were, always popping open at inopportune moments and never looking quite as tidy as they ought. I’ve been wracking my brain, though, and I can’t come up with a way to adjust the closures that won’t require major pattern surgery. A back opening doesn’t work with the sailor collar, and a front opening would be a fairly major design change. I don’t want to make the collar removable, either, because that’s just as fiddly. If it were a dress for me, I’d probably go with the “vintage details” just for the fun of it, but the last thing I want to make my niece is a dress that’s annoying to wear. And I don’t trust that the head opening will be large enough if I sew the dickie in place, although obviously I can sub in a zipper at the side seam. *Also, for the avid readers, a part of Carol Evans’ Wardrobe. I am no help on the 3D front (I can barely get my head around how sleeves work 8-D), but how about making a little tank that she could wear under the dress instead of the dickey? You could make it with a square neckline and it would look pretty much the same. Wouldn’t it? It could also act as a slip if you made it long enough. That’s what I was going to suggest also. I have used buttonholes on the dickie, with the buttons attached to the neckline. Can’t help with vintage. Sorry. But I did have a thought about a dickie with buttons. Zipper in the side placket — yes! Zippers were just beginning to take over the world in the 1930s, so not an un-vintage detail. Velcro the dickey, if you can’t get away with sewing it in place. Pattern looks to have p-l-e-n-t-y of headroom without detaching the dickey. I have fond memories of those (original) dresses. For the little triangular piece in the front ‘vee’ , what about stitching it in place on one side, and going for a velcro dot on the other ( or a button and buttonhole, which I think may be what those in the tickle-trunk have). Could you do an invisible zipper on the front from the bottom of the collar to the skirt? You could then tie the bow over it and snap the dickie under? Industrial strength velcro. I mean, the NASA program was good for something, right? Didn’t Debi at My Happy Sewing Place do a sailor dress a year or so ago? Maybe her posts will have some good info about how it was constructed? You can put in a center back zipper. It will go through the waist seam so that opens enough to pull the dress on over her head and shoulders. Stop it just short of the neckline so the collar is not affected. It will be closed at both ends, just take a couple of stitches across the top of the zipper to hold both sides of the tape together. The collar will hide the top of the zipper when the dress is worn. Your blog is evolving every day. I am so impressed with it that I have nominated you for a Leibster Blog Award. More details are in my blog. I had a similar dress as a child eons ago with the removable dickie, snaps and incumbent drama. I would sew the dickie to the lower point, from point one to point two of the triangle, and add a button on point three with the buttonhole tucked under the edge of the collar, (or visa versa button placement, as desired). wonderful gift, love your blog.